One way to add more resistance to your walking, running or strength training workouts is with the best cheap weight vest. Unlike barbells, dumbbells or kettlebells, these training vests allow you to move naturally. The functional quality of these devices make them great to use when training for sports or if you want to be able to have your regular range of motion during your workouts. Depending on how much resistance you need, you can choose something from as little as an 8 lb. weight vest to something that’s over 70 lbs. The good news is a lot of the products are inexpensive. Below we list our top picks as well as review each product. Tone Fitness Weighted Vest, 12 lbs. Why Use Weight Vests: Do You Need One for Your Workout? Weight vests, like dumbbells and barbells were designed to help with training. While they’re very useful for building strength and gaining muscle mass, these vests excel most in improving performance. Weigh vests allow you to work on your cardio and strength anywhere. They all resistance to your bodyweight to make your workouts harder. In fact, research shows that using a weight vest can go a long way in boosting your results. Research published in the Journal of Applied Physiology shows that athletes who added weight vest training saw a 30% improvement in leg strength and 11-13% boost in endurance. All this after just 10 weeks. One study also found that running with a weight vest that was 10% of the participants’ body weights produced a 25% gain in sprint endurance and 3% improvement in stair running speed. You can likewise benefit by using the vest while walking on your treadmill. The journal Medical Science Sports Exercise cites that doing this increases the number of calories burned as well as exercise intensity. Overall, using a weight vest, whether for walking, running or strength training, makes the workout more challenging. As a result, it helps boost metabolism, performance, strength and endurance. Weight vests are very specific in their benefit s and drawbacks. This is because of their design and build. The vests help you best when worn on your body. But, they can also be limiting because they move and bounce around in certain types of exercises. In this section we look at the advantages and disadvantage of weight vests and training with them. Weight vests pull on your traps, making them uncomfortable or sore. Adding and removing weights can be a hassle. Putting a weight vest on instantly increases the level of intensity. This is great for anyone trying to improve their endurance or lose weight. Among the best workouts to do with a weight vest, from beginner to more advanced are, brisk walking, treadmill walking and stair climbers. Research shows that by just adding a weight vest, you immediately get about a 5% increase in heart rate doing these exercises. If you want to kick things up a notch, try doing burpees or mountain climbers with the weight vest on. Doing so will help you burn more calories that running. The second type of workout where weight vests work very well as bodyweight exercises. They force you to deal with more resistance. This helps you get stronger, build more muscle mass and burn more fat. With strength exercises, it’s important not to use too much weight on the vest. This helps prevent injuries or poor form. If your goal it to build explosive strength, then plyometrics is the way to go. Adding a weight vest to these exercises helps boost speed, explosiveness and vertical leaping ability. It is important though, not to use anything too heavy. Doing so may mess with proper mechanics, be it during sprinting or jumping, which may ultimately affect your gains. Designed for ease for use and comfort, this 8 lb. weight vest is adjustable and suitable for both workouts and running. The vest itself weighs 4 lbs. so you can use it without adding the extra any of the 4 one pound weights that come with it when you’re starting out. Unlike many of the heavier vests in our reviews here, this device is designed much like a backpack, though without the pack itself. From the front the straps are similar to that of a backpack with the weight on the rear. The design makes it easier to wear and take off compared to the full body vests that you wear over. It also offers your body more ventilation since there isn’t any fabric that wraps around your body when you wear it. One thing of note is that the device comes in one size and it isn’t adjustable. It isn’t made to fit large individuals and can fit people who are between 4’10 for petite women and young kids all the way to those who are 5’8 to 5’10. As far as cost is concerned, this is the cheapest weight vest for exercise and running. Best Cheap Weight Vest for the Money: In the lower weight class, this Cross101 20 pound training vest offers the best value for money. 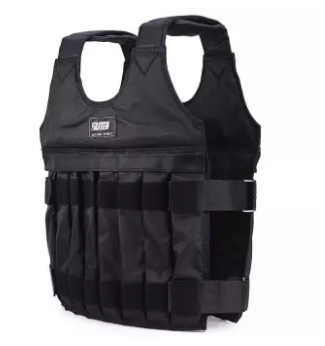 It offers more adjustability as well as capacity compared to the SELF vest above and costs just a few dollars more. It does have a camouflage design which makes it more suitable for men rather than women. But if you don’t mind about the color scheme then this device offer a great way to increase the resistance of your training. The device wears much like a bulletproof vest that law enforcement officers use where you put it on through your head. The front and back fabric can then fit snug against your body by adjusting the horizontal velcro belt across your waist to secure the vest. The unit comes with 2.5 lb. weight sacks. There are a total of 8 of these sacks which combine for the 20 lb. capacity. You may opt to use no weight or add 2.5 lbs. at a time depending on the type of workout you’re doing. The weights themselves are distributed in the front and back sides of the vest. Four pockets line the front and another 4 line the back making the weight uniform across. This allows it to be uniform during use even when you need to jump. Very similar to the Cross101 unit above, this one is similarly priced and comes in an all black color. We’ve noticed that many people prefer the all black color compared to the camouflage design since it’s more traditional. The vest is designed for both men and women making it something anyone who’d like to add to their body weight to use. Measuring about 17 inches long, it can be a bit long for those who are 5’3” or shorter. Depending on what type of workouts your do this may or may not be an issue. Also if you don’t mind pulling it up every now and then during your workouts, then the price may be a good compromise. One major difference between this and the similarly weighted Cross101 20 lb. vest above in our reviews is that the poundage of this device is distributed among ¾ lb. bags. This means that you’ll be able to adjust the weight more precisely since the increments go up by smaller amounts. On the other hand, you do need to deal with inserting or removing more bags if you do adjust the poundage regularly. Right in between the 8 pound and 20 pound range is this unit by Tone Fitness. Unlike those above, this is not adjustable. So the 12 lbs. is fixed and you won’t be able to increase or decrease the poundage should you want to. This makes it more convenient to use because you just have to put it one. It wears like the SELF vest in that it uses a back pack style strap setup with the weights fitted throughout the device. Though do keep in mind that while this style offers more ventilation and freedom for the body, the weight isn’t as distributed as the fully fitted vests that wrap around the entire body. The weight is tipped towards the back of the device much like a backpack. Made for home workouts, calisthenics, walking and running outside, it is made from durable material that’s also soft to the touch. It also comes with a small pocket on the left strap where you can keep your mobile phone or music player while you exercises. Should you need more than 20 lbs. then this 40 lb. weight vest is offered at an affordable price. As you’d expect the sewn in pockets and additional weights make this cost more than the cheaper units above. Forty pounds is a good weight to have for most men who want to workout as it offers enough of a resistance for lower body exercises. Like many of those earlier in our reviews, this devices is adjustable so you can reduce the poundage to as little as you want. The setup is similar to the lighter ZFOsports model above but does include more weight bag and pockets to fit them in. The weight bags are the same 2.5 lbs. so you put as much or as little weight as needed and work your way up to the maximum 40 pound capacity this vest can hold. The vest comes with two velcro straps that wrap around the body. One for just below the chest area and another closer to the belly. These two belts keep the device secure around the body as you move during training. When starting out, a good, inexpensive vest helps you get stronger, burn more calories and train with natural movements. They are a great complement to any weight training or cardio routine.